There are many ways you can organize and store your papers and files in your home office, and one of these ways is with a cart with wheels. This is not ideal in every home, because the open design means little fingers from children can easily get in there, and move around your files. However, if you've got older kids who won't rifle through your files this can be a good solution for you. This solution allows you to see the main files you have all the time, so you don't forget what you have. Plus, if you need to move your files around, such as if you work sometimes at the kitchen table, and sometimes on the couch, etc., being able to move the files around on the wheels can be quite helpful. In addition to being able to organize files and household paperwork in this file cart, it is also a good choice for scrapbookers or other paper crafters, because you can use it to organize and easily access various cardstock whenever you need it. Plus, if you like to craft in many areas of your home, it will easily roll to go where you want it to. 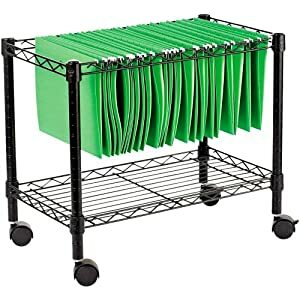 If you purchase a system like this you will also need to purchase hanging file folders, such as the ones below, that work with it. You can see even more home office storage solutions and home office organizers recommendations and ideas. Join in and write your own page! It's easy to do. How? 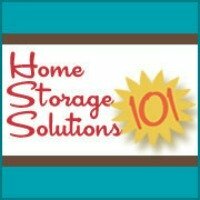 Simply click here to return to home office storage solutions.